Physically distinct cholesterol/sphingolipid-rich plasma membrane microdomains, so-called lipid rafts, have been recognized to play an important regulatory role in various cellular processes, from membrane trafficking to signal transduction, in a number of cell types. We report here that the ability of TCR on activated, functional CD8+ T lymphocytes to efficiently bind MHC class I tetramer complexes is dependent on the integrity of lipid rafts on the T lymphocyte membrane. We further provide evidence that TCR interact (associate) with lipid raft elements on the T cell surface before receptor engagement and that the topological arrangement of TCR on the cell surface is likewise influenced by lipid raft integrity. Within the lipid-disordered plasma membrane of numerous cell types are biochemically distinct microdomains that are rich in cholesterol and sphingolipids. These lipid-ordered regions, commonly called lipid rafts, are characterized by their insolubility in non-ionic detergents and low buoyant density when isolated by gradient centrifugation (1, 2). It is thought that these detergent-resistant membrane domains play an important role in numerous cellular processes, including membrane trafficking and the initiation of signal transduction pathways (2). A number of studies suggest that lipid rafts promote the activation of T cells. Many key TCR-associated signaling molecules, such as the Src family kinases Lck and Fyn, are constitutively associated with lipid rafts (3). These kinases, in concert with other raft-associated molecules, transduce intracellular signals after TCR ligation that lead to tyrosine phosphorylation, Ca2+ flux, and ultimately T cell proliferation (4). Further evidence supporting a role for lipid rafts in regulating T cell activation comes from studies showing that lipid rafts accumulate at the site of TCR engagement, that T cell priming induces plasma membrane lipid raft formation, and that disruption of these microdomains abrogates essential T cell-specific signaling cascades (5, 6, 7). We recently reported that CD8+ T cells directed to a subdominant epitope of the influenza hemagglutinin (HA)3 protein activate in response to Ag and express normal levels of TCR but lack effector activity and fail to bind specific MHC class I tetramers (8). On further stimulation with specific Ag, these activated CD8+ T cells become cytolytic, produce IFN-γ, and transition from a tetramer-negative (nonbinding) to a tetramer-positive (binding) phenotype, without any change in the level of cell surface TCR. At the time, we speculated that the display or arrangement of TCR on the surface of these activated T cells might influence the efficiency of binding of TCR by tetramer, possibly as a result of an interaction or association of TCR with plasma membrane lipid rafts (8). In this report, we examine the role of lipid rafts and lipid raft integrity on the strength of the interaction of MHC class I tetramers with TCR on a functional, activated CD8+ T cell population. Using several methods to disorder lipid rafts, we show that disruption of low density microdomains leads to a loss of tetramer binding by the CD8+ T cells without affecting expression of TCR or other cell surface molecules. Furthermore, we demonstrate that the TCR on activated CD8+ T cells is displayed on the cell surface in a nonuniform, asymmetrical pattern and that disruption of lipid rafts leads to a change in TCR display from an asymmetrical to diffuse distribution. Thus, the results of this analysis provide evidence that TCR may interact with (is associated with) lipid rafts before TCR engagement and that lipid raft organization influences cell surface TCR array. Methyl-β-cyclodextrin (MβCD; Sigma, St. Louis, MO) was dissolved in water (0.5 M) and diluted in DMEM containing 50 mM HEPES buffer. Filipin (Sigma) was dissolved in absolute ethanol (5 mg/ml) and prepared in PBS at the indicated concentrations. Simvastatin (Calbiochem, La Jolla, CA) was prepared as described (9). Fluorescently labeled anti-TCRβ (H57-597), anti-CD3ε (145-2C11), anti-CD11a (2D7), anti-CD25 (RD4), and anti-Ly6C (AL-21) Abs were purchased from PharMingen (San Diego, CA). FITC-conjugated cholera toxin β subunit (CTx; Sigma) was used to label lipid raft ganglioside GM1. MHC class I tetramers were prepared as described (10) using a plasmid DNA encoding the extracellular domain of the H-2Kd heavy chain and human β2-microglobulin provided by J. D. Altman (Emory University, Atlanta, GA). Synthetic influenza HA and nucleocapsid protein (NP) peptides were synthesized at the Biomolecular Core Facility at the University of Virginia Medical Center. An optimal tetramer concentration of 3.5 μg/ml was used for cell surface staining. To selectively remove or intercalate cholesterol in lipid rafts, cells were washed in PBS, incubated in serum-free DMEM containing MβCD for 30 min at 37°C or PBS containing filipin for 15 min at room temperature, and then washed extensively in PBS and stained for flow cytometry at 4°C using staining and washing solutions containing 0.05% sodium azide. For cholesterol synthesis inhibition, cells were washed thoroughly in cholesterol-free OptiMEM medium (Life Technologies, Gaithersburg, MD) and then plated in OptiMEM containing human recombinant IL-2 and l-glutamine in the presence or absence of 5 μg/ml simvastatin. Cells were incubated for 12–48 h at 37°C and then stained for flow cytometric analysis. To prepare cells for confocal microscopic analysis, untreated or MβCD-treated D4 clone was labeled with CTx, Abs, or MHC tetramer at 4°C in buffer containing 0.05% sodium azide, fixed with 2% paraformaldehyde, and cytospun onto glass slides. To overcome the effects of cholesterol synthesis inhibition, cells were cultured in Optimem containing simvastatin (5 μg/ml) and 10% FBS, 1% bovine cholesterol-enriched low density lipoprotein (LDL; Sigma), or 0.5% squalene (Sigma) for 18 h and then analyzed for cell surface marker expression by flow cytometry. To reverse the effects of cholesterol depletion, MβCD-treated cells were incubated at 37°C for 3 h in serum-free medium containing 1% LDL-cholesterol, 400 μg/ml water-soluble cholesterol (Sigma), or 0.2 mM MβCD-cholesterol complexes (11). BALB/cAnNTac mice (Taconic Farms, Germantown, NY) were primed i.p. with 5 × 106 PFU (25 HA U) of infectious A/Japan/305/57. After >3 wk, immune splenocytes were stimulated in vitro with HA204 peptide-pulsed (10−9 M) splenocytes as described (8). Cells were harvested 5–6 days post in vitro stimulation. CD8+ T cell clones D4 and 14-13 are stimulated biweekly with the HA210–219 and NP147–155 epitopes of A/Japan virus, respectively. To determine whether lipid raft organization affects the binding of TCR to tetramer, a clonal population of functional influenza HA210–219-specific CD8+ CTL (clone D4; 12), with in vivo and in vitro effector activity, was treated with varying doses of the lipid raft disrupting agent MβCD and analyzed for cell surface TCR expression and HA210 tetramer binding. Treatment with MβCD over a range of concentrations did not alter cell surface TCR expression (Fig. 1⇓), a finding consistent with previous evidence that disruption of lipid rafts on T cells has little or no effect on cell surface TCR levels (13). By contrast, MβCD treatment substantially decreased the efficiency of tetramer binding by the T cells in a dose-dependent manner (Fig. 1⇓). Disruption of lipid rafts had little effect on the level of the T cell surface molecules CD11a (Fig. 1⇓), CD3, CD8α, CD8β, or CD25 (data not shown), but did result in a modest (2-fold) decrease in the staining intensity of the GPI-linked, raft-associated Ly6C molecule (data not shown), suggesting that treatment with MβCD may preferentially affect the detection of certain lipid raft-associated molecules. In addition, the preferential effect of MβCD treatment on TCR binding to tetramer was not dependent on active energy metabolism in the T cells, given that D4 cells treated with MβCD in the presence or absence of sodium azide showed a comparable selective decrease in tetramer staining (data not shown). This finding suggests that the loss of tetramer binding by TCR after MβCD treatment likely represents a direct effect of lipid raft disruption rather than an energy-dependent signaling event associated with MβCD treatment. Disruption of lipid rafts decreases MHC class I tetramer binding. Clone D4 was treated with various doses of MβCD (bold solid line, no drug; solid line, 5 mM; dashed line, 10 mM; dotted line, 20 mM). for 30 min at 37°C and then labeled with HA210 tetramer or Abs specific for TCR or CD11a at 4°C in the presence of sodium azide. Isotype Ab or irrelevant tetramer controls are included in all histogram plots (light dotted line). The decrease in binding of TCR by tetramer after lipid raft disruption was not a unique property of the HA210 tetramer or the D4 clone, because we found similar results when NP147–155-specific CD8+ T cells (clone 14-13; 14) and a heterogeneous population of activated influenza HA204–212-specific CD8+ T cells generated in short term culture were treated with MβCD (data not shown). MβCD disrupts the integrity of lipid rafts by extracting cholesterol from plasma membranes (15). If, as the above results suggest, the efficiency of TCR binding to tetramer is influenced by the integrity of plasma membrane lipid rafts, then other methods to disrupt lipid raft organization on the CD8+ T cell membrane should likewise affect the interaction of TCR with tetramer. To evaluate this possibility, we examined the effect of filipin or the inhibitor of cholesterol synthesis, simvastatin, on TCR expression and tetramer binding by D4 cells. Unlike MβCD, filipin disrupts lipid microdomains by binding to and intercalating cholesterol-rich lipid rafts (16). As Fig. 2⇓ shows, tetramer binding on filipin-treated D4 T cells decreases in a dose-dependent manner, whereas TCR levels remain constant or increase slightly when cells are treated with a high dose of the drug. 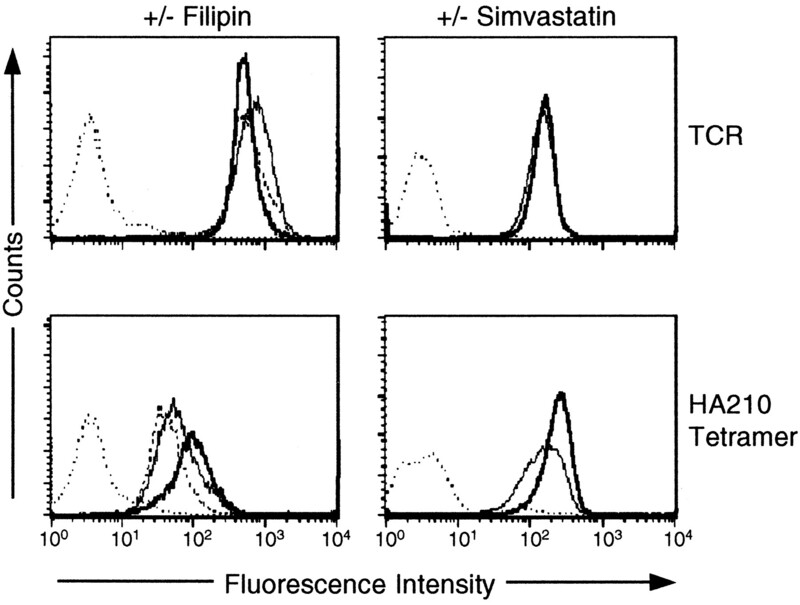 Disruption of lipid rafts by treatment with filipin or simvastatin inhibits HA210 tetramer binding. Clone D4 was treated with filipin for 15 min at room temperature (bold solid line, no drug; solid line, 2.5 μg/ml; dashed line, 5 μg/ml) or simvastatin (bold solid line, no drug; solid line, 5 mg/ml) for 12 h, followed by labeling with anti-TCR Ab or HA210 tetramer. Simvastatin suppresses the de novo synthesis of cholesterol by inhibiting 3-hydroxy-3-methylglutaryl coenzyme A reductase, a critical enzyme in the cholesterol synthesis pathway (17). Exposure of D4 T cells to simvastatin for 12 h in lipid- and serum-free medium also resulted in a modest but significant decrease in tetramer binding, with no change in the level of TCR (Fig. 2⇑). 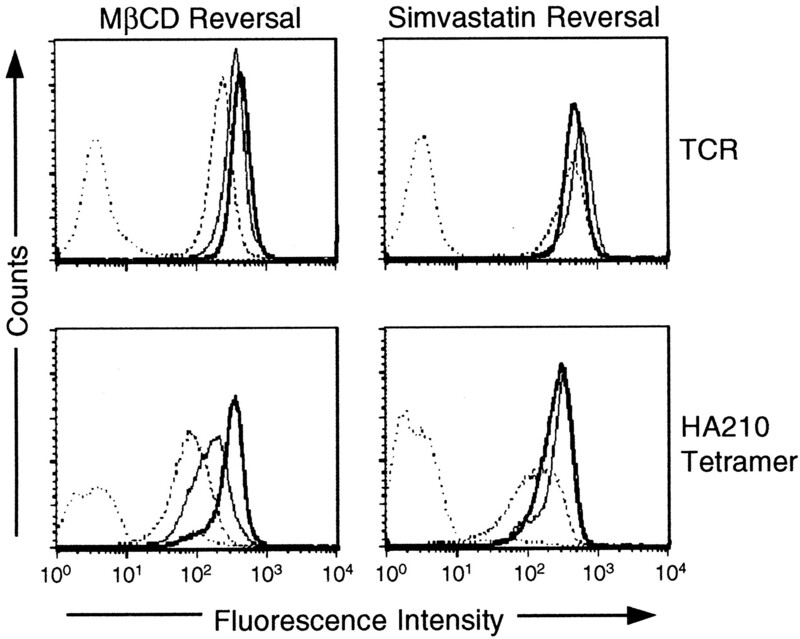 Treatment of the cells with simvastatin for longer times (24–48 h) led to a more dramatic selective reduction in tetramer binding (data not shown), but the inhibition of tetramer-TCR interaction was associated with a significant decrease in the viability of D4 cells (>60–70% cell loss), presumably because of serum and/or sterol deprivation. If cholesterol depletion and the associated lipid raft disruption result in the decreased efficiency of tetramer binding by TCR, the reincorporation of cholesterol into the plasma membrane should reverse the effect of these cholesterol-active agents. To test this possibility, D4 cells treated with MβCD were incubated for 3 h in serum-free medium containing soluble complexes of MβCD and cholesterol, which have been reported to facilitate the incorporation of exogenous cholesterol into membranes (18). As Fig. 3⇓ shows, treatment of cholesterol-depleted D4 cells with MβCD-cholesterol complexes resulted in a partial restoration of tetramer binding by the cells and also reversed the modest decrease in TCR staining intensity exhibited by the T cells after lipid raft disruption. These results are consistent with a recent study showing that the addition of cholesterol to a transgenic T cell line increased specific MHC dimer binding (19). The inhibitory effects of MβCD and simvastatin on tetramer binding are reversible. The D4 clone was treated with MβCD and then incubated with 2 mM MβCD-cholesterol complexes for 3 h, followed by staining for flow cytometry. Alternatively, D4 cells were incubated with 5 μg/ml simvastatin in the absence or presence of 10% FBS for 18 h and then labeled with anti-TCR Ab or HA210 tetramer. Bold solid line, Untreated cells; dashed line, treated cells; solid line, treated cells after reversal. To examine the impact of exogenous cholesterol on cells blocked in de novo cholesterol synthesis, D4 cells were treated with simvastatin in the presence of FBS as a source of lipoprotein-cholesterol complexes. Again, the selective decrease in tetramer binding produced by treatment with simvastatin was reversed by the addition of serum (Fig. 3⇑). We also attempted to reverse the effects of MβCD and simvastatin on tetramer-TCR interaction by adding squalene, a partially water-soluble intermediate in the cholesterol-biosynthetic pathway (20), water-soluble cholesterol, or purified cholesterol-enriched LDL to the treated cells, but these strategies were unsuccessful (data not shown). The reasons for this lack of reversal are not clear but may be due in one instance to the amphiphilic properties of sterols (squalene) in aqueous solution and in the other to the inefficient uptake of these isolated lipoprotein-cholesterol complexes by the cells through the endocytic pathway (15). The above observations suggest that TCR are displayed on the activated T cell in an array favorable for efficient TCR interaction with soluble MHC class I tetramers and that the arrangement of TCR on the cell surface is influenced by the integrity of plasma membrane lipid rafts. To examine the display of lipid rafts and TCR on intact D4 T cells, we used confocal microscopy using CTx to identify the ganglioside GM1, which is enriched in and preferentially associated with lipid rafts, and anti-TCR β-chain Ab to label TCR. To evaluate the impact of lipid raft disruption on TCR arrangement, untreated and MβCD-treated cells were examined. For this analysis (as well as in the experiments described above), staining of lipid rafts and TCR was conducted at 4°C in the presence of sodium azide to block any energy-dependent signaling events associated with CTx or anti-TCR Ab binding to the cells. On untreated D4 T cells harvested at least 7 days after in vitro stimulation with specific Ag, GM1 was distributed uniformly throughout the plasma membrane in a diffuse, ring-like manner, typical of the lipid raft distribution seen on other cell populations (5). There were several areas of more intense GM1 staining, suggesting some asymmetry in the array of lipid rafts on the plasma membrane surface (Fig. 4⇓). By contrast, we repeatedly observed that TCR was not uniformly distributed on the cell surface but rather was primarily asymmetrically localized to distinct regions of the plasma membrane (Fig. 4⇓). 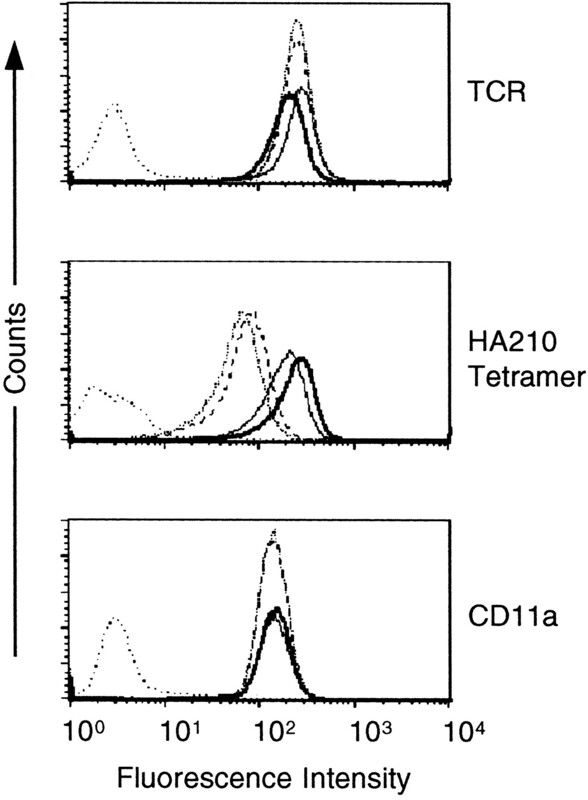 An identical TCR staining pattern was observed when fluorochrome-labeled HA210 tetramer was used to label this cell surface marker (data not shown). Disruption of lipid rafts alters the array of TCR on the cell surface. D4 cells left untreated or treated with MβCD were labeled with CTx-FITC and CyChrome-labeled anti-TCRβ, or CTx-biotin followed by streptavidin-FITC and anti-TCRβ-CyChrome. Cell were fixed, cytospun onto glass slides, and examined by confocal fluorescence microscopy. These regions of dense TCR localization almost invariably colocalized to regions of the plasma membrane that contained the highest concentration of lipid rafts. To further substantiate the possible steady state association of TCR with lipid rafts, cells were treated with biotin-labeled CTx and aggregated in the cold by cross-linking with FITC-labeled streptavidin, followed by Ab staining for TCR. Cross-linking of the lipid microdomains resulted in the formation of one or more distinct raft caps on the plasma membrane surface (Fig. 4⇑). Importantly, aggregation of lipid rafts also resulted in the colocalization of TCR to the raft cap (Fig. 4⇑). Treatment of the T cells with MβCD had a minimal effect on the pattern of CTx staining (Fig. 4⇑). Treated cells exhibited a relatively uniform ring-like staining pattern with notably fewer areas of focal increased GM1 labeling than observed on untreated cells. The effect of MβCD on TCR arrangement was more dramatic, with TCR now exhibiting a much more diffuse, ring-like distribution (Fig. 4⇑). Importantly, cholesterol depletion by MβCD inhibited both the formation of lipid raft caps after CTx cross-linking (Fig. 4⇑) and TCR aggregation after cross-linking of cell surface bound anti-TCR Ab (data not shown). In keeping with the above observations (Fig. 1⇑), MβCD treatment did not result in a decrease in GM1 content on the plasma membrane, as determined by the intensity of CTx staining in companion flow cytometric analyses (data not shown), which further supports the view that lipid raft disruption results in a redistribution, rather than a loss, of cell surface molecules. The results reported here suggest that the arrangement of TCR on the surface of activated CD8+ T cells is influenced by the organization and integrity of lipid rafts in the plasma membrane. The difference between the TCR-tetramer interaction and the TCR-anti-TCR Ab interaction, in their respective sensitivity to lipid raft disruption, may be related to the relatively low intrinsic affinity of the interaction between TCR and individual peptide-MHC class I complexes (21). If so, then the TCR are likely to be normally clustered or arrayed on the cell surface in a manner that facilitates the multivalent interaction between the low affinity TCR and its tetramer ligand, and redistribution of cell surface TCR after lipid raft disruption may adversely affect tetramer binding while not affecting the binding of Ab to TCR. Because CD8 can influence the binding of particular MHC tetramers to TCR (22) and because the β chain of this coreceptor partitions to lipid rafts (23), it is possible that the decrease in tetramer binding after lipid raft disruption may also reflect a change in the interaction of cell surface TCR with CD8, which in turn could alter the strength of tetramer binding. Observations from a number of laboratories indicate that TCR is not associated with low density, detergent-insoluble lipid domains before Ag contact (3, 24), but only colocalizes transitorily with lipid rafts after Ag encounter (13). The finding of extensive colocalization of TCR with lipid rafts on intact cells reported here and recently by Janes et al. (5) suggests the possibility of a baseline steady state association of TCR with lipid rafts and that such interactions at the plasma membrane may not always withstand physical membrane isolation procedures (1, 5). Furthermore, the possible requirement for TCR to be recruited to lipid rafts to engage critical raft-associated signaling intermediates necessary for T cell activation do not exclude TCR-lipid raft interactions before TCR engagement if there is heterogeneity among lipid rafts in their molecular composition (1). The observations described herein showing that lipid raft integrity affects the display of cell surface TCR provide a possible explanation for our recent finding that virus-specific CD8+ T cells undergoing incomplete activation in response to virus infection fail to bind specific MHC class I tetramers (8); that is, the display of TCR on the surface of these partially activated CD8+ T cells is unfavorable for efficient tetramer binding. A study by Fahmy et al. (19) supports this claim by demonstrating that TCR on activating T lymphocytes redistributes to an arrangement that greatly enhances the binding of specific MHC dimers and that the modulation of plasma membrane cholesterol content likewise influences the efficiency of TCR binding to MHC dimers. Furthermore, recent studies demonstrating that binding of MHC class II tetramers to CD4+ T cells depends on the activation state of the cell (25) and that recruitment of BCR to lipid rafts after receptor cross-linking is dependent on the state of B cell maturation (26) also suggest that the arrangement of Ag receptors on lymphocytes, through their association with lipid rafts, may be regulated during cell differentiation and activation. The finding that T cell activation induces the rapid synthesis and recruitment of lipid raft ganglioside GM1 to the plasma membrane also suggests that low density microdomains may regulate T cell responsiveness (6). Our results (8) showing that activated CD8+ T cells can exhibit Ag-specific effector activity, i.e., in vitro cytolysis or cytokine secretion, without staining with specific tetramer may also reflect lipid raft-mediated control of TCR arrangement. Additional studies will determine the extent of the impact of these TCR-lipid raft interactions on T lymphocyte activation and function. We thank David Damon for assistance with confocal fluorescence microscopy and Dr. J. Altman and his laboratory for advice in tetramer preparation. ↵1 This work was supported by grants from the U.S. Public Health Service. ↵3 Abbreviations used in this paper: HA, hemagglutinin; MβCD, methyl-β-cyclodextrin; CTx, cholera toxin β subunit; NP, nucleocapsid protein; LDL, low density lipoprotein.